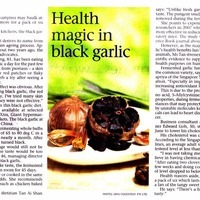 On several occasions have you heard of black garlic and its almost miraculous properties for our body, but ...... You know it is and as it occurs ?. The black garlic is produced for the first time in Japan. Apparently a scientist began researching how to reduce the strong smell of common garlic ( Allium sativum ), so one of the options used was smoked by. At the end of the process, the garlic was completely black, with characteristics very different to the white garlic employment for the experiment. The black garlic is obtained from common raw garlic, transformed by natural fermentation in another product. This fermentation process is obtained by the heads of garlic in a sealed chamber, crock pots or electric rice cooker, dehydrator or oven at low temperature. The next step is to keep a constant temperature of about 30 days at 60 ° C (140 ° Fahrenheit). Previously they salted with sea water to improve their fermented. After 30 days, they have caramelized garlic, obtaining its characteristic black color, but it is still preferable to let them ferment out of the dehydrator another 40 days to finish maturing. The process I followed was similar. First dipped the garlic for 10 minutes in water previously boiled sea and cooled, then I wrapped them in foil, cooking them at 60 for 10 or 12 days (each time spent oven for any development, leaving them for a few hours with the oven off when reaching 70 ° C, using the residual heat of the oven). Then to not let them spoil over six days in the sun (June), without taking them out of aluminum, allowing finished cooking. When you open the foil were completely finished with a tender and creamy texture. Then I put it in a plastic container to ferment. To keep can keep the grains in oil or without removing them from their natural wrapper. I will I keep sundried a "Tupper" plastic, I seem to last longer. The sangria, perfect to cool this summer.